First things first, I’m going back next year and I’m accepting athletes now to train for this race. And we’ll be planning a training camp in March of 2018. More details coming soon. Ok, now onto the report. 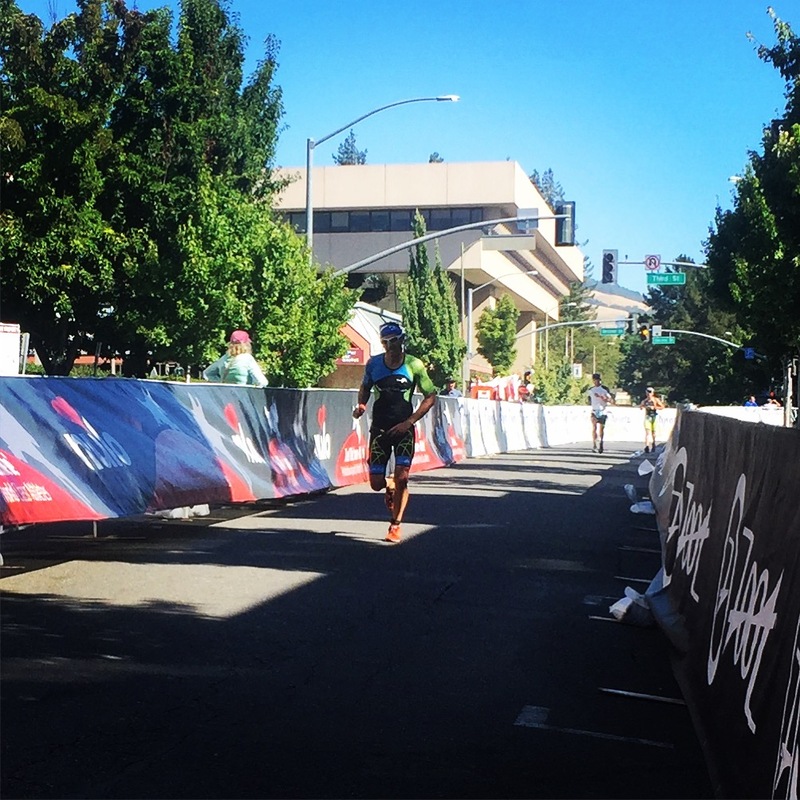 Ironman Santa Rosa – 1 of 3 Ironman races this year! Having not 1, not 2 but 3 Ironman distance events on the schedule in a span of 16 weeks is quite exciting for most, or maybe that’s just how I like to approach it. After all, I did consciously sign up for these races myself knowing full well what I was getting into. I have had questions about my plan of attack for this season, but any thoughts I did have about a plan came and went pretty quickly. Why? Because although I know my body very well, I just can’t speak to how it will feel after the first race or the days leading into the last one. My plan is quite simple. Train hard. Rest even harder. Take each workout of each day as it comes. Embrace the unknown. And be willing to fail in giving it your all. And that last point is what this season is about for me. Going to places in a race I’ve never been to, or haven’t been to in a while, all with the understanding that I just may fail. Now fail can mean a DNF or simply not meeting a time goal. But now we’re getting into specifics, and for now, let’s just keep this as an ambitious goal to seek out what drives me and how far I can dig to have a great race. 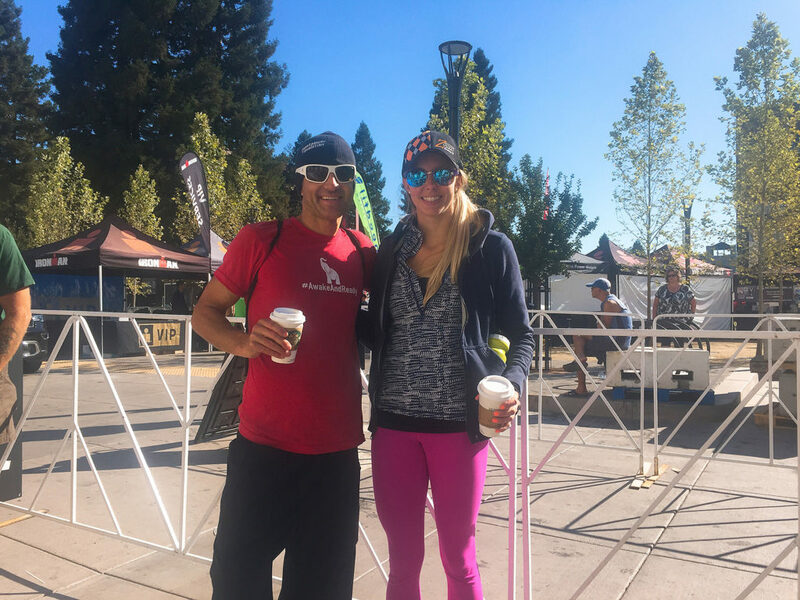 Now, let’s get to the race recap for Ironman #1: Ironman Santa Rosa! Arrived in Santa Rosa late Wednesday night after some podcasting appointments. I like to get into town the first day of registration, but in this case, the schedule didn’t align. No biggie, need to be flexible. Thursday and Friday we offered up yoga in the square which is something that Jess started at Ironman Lake Placid a few years back. We met so many new friends that we still know today and it’s been super beneficial for the athletes who are sometimes nervous and need that voice of calm. We provide that. Couldn’t sleep the night before the race. But that’s usual. The most important night is actually 2 nights before the race. That’s what counts. Planned to wake up at 2:30am so I could get my breakfast in at least 3 hours before my start. That’s something I always do. But was up around 1, 1:30, etc… As most athletes are restless before a big race. Breakfast goes down by 3am giving me enough time to digest, preferably 3 hours before my wave start. Shuttle buses start leaving at 4am from downtown, so this gives me enough time to sit quietly in meditation for at least 20 minutes and calm the mind and body, focus on the simple things and allow my thoughts to appear, but then move on by. Now that is the key with meditation…not blocking out your thoughts, but allowing your thoughts to appear and be the observer. Watch as your mind wants to invite those thoughts to come sit down and feed the “story”, but in reality, you have a choice. And that choice is completely up to you. I choose to let them come in, and I choose to let them go. I don’t give them any added attention. I just let them be. Meditation allows you to begin to see things clearly. The clutter falls away. The distractions. The things you think are real but are not. Having this clear mind and ability to stay calm in the chaos translates so well to triathlon. Race day will have so many opportunities for you to remain calm through the chaos. Use your energy wisely. Jess awoke to my gentle nudge at 3:40am and she and Clark got up and out the door to drive me to the shuttles. As we arrived, I realized this would be the last time I get to see my pack until the first few miles of the run. We decided it just wasn’t worth it to have Jess make her way to the lake, watch the swim and then make her way back downtown to see me finish off the bike. We’ve supported each other in so many races, we know where we are best utilized. So basically Jess would help cheer me on to run a marathon. Exactly where I needed them both! Jumped on one of the first buses and sat by myself on the way to the lake. This 30 min ride allowed me time for a second meditation. This one was more race visualization and walking through how the day would go. This visualization is something I work into my meditations weekly, depending on what race is coming up and what thoughts enter my awareness. I don’t plan to meditate on a race, it just shows up. And when you release from those expectations of what you should be thinking about versus waiting patiently for something to show up, those are the best experiences I’ve had. Exited the bus and made my next stop the port-o-johns down by the boat ramp. We learned at Ironman 70.3 in May that these were all open and unused first thing in the morning. As athletes were getting their gear together in transition, down by the swim start there is a big row of open bathrooms. I’m sharing this with all of you to keep in mind next year. But if you eat the right foods, and eat your breakfast early enough, the bathroom becomes less of something you need to focus on. More on nutrition in our podcasts. After all my bottles were placed on the bike and my bike gear bag packed with my helmet, shoes and sunglasses, I made my way to the morning bag drop off. 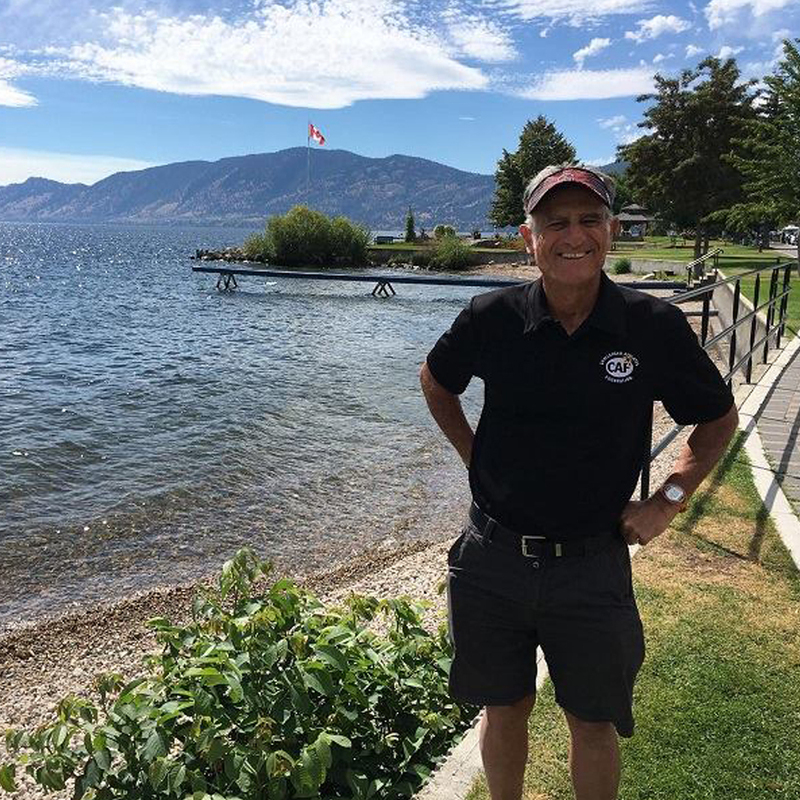 This is where I put my wetsuit on, after hearing Mike Reilly announcing it was a wetsuit legal swim. I was prepared for both. It never was an issue for me. The buzz around wetsuit or non-wetsuit was quite overwhelming when you read through the Facebook groups and general social chatter. Here’s my thoughts on this topic. 1) You don’t have any control over whether it’s a wetsuit legal or not. That decision is out of your control. So right there you can save some energy and avoid decision fatigue. 2) If you trained properly, you should have no issue in the water with or without a wetsuit. 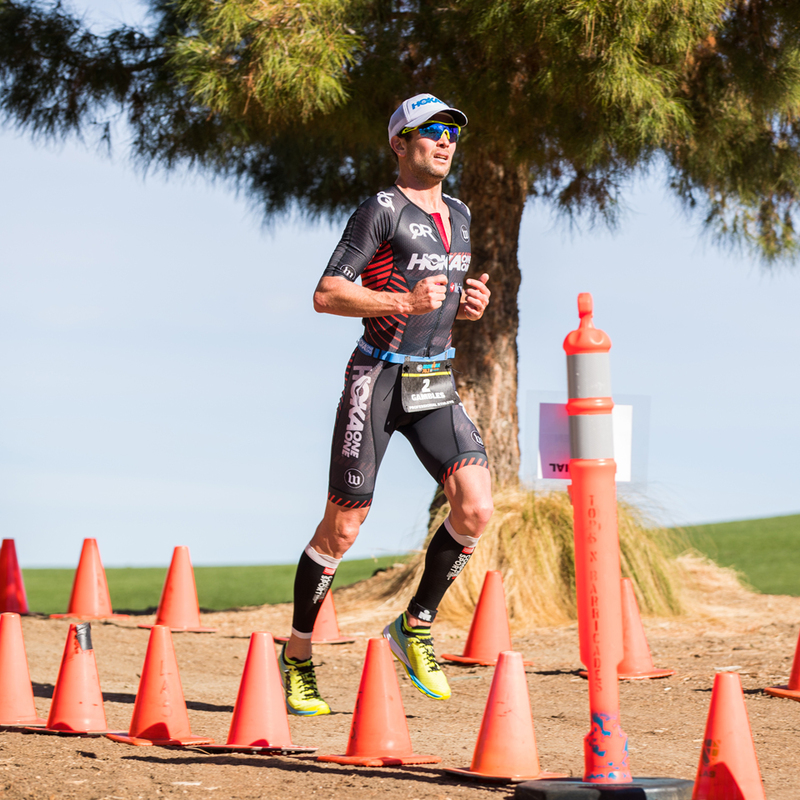 The months leading into your race are meant for swimming in open water, practice sighting and realizing what you need to work on, and then, this is the key, work on it. If you have trouble swimming in open water with others, then get in open water and swim with others. It’s your choice to face these moments and grow from the. The only reason you have nervousness around these experiences is because you don’t have experience with them. Embrace the unknown. Walked myself down to the swim start early so I could get in the water and do my pre-race warm up. It surprises me how many swimmers don’t do any warm up. 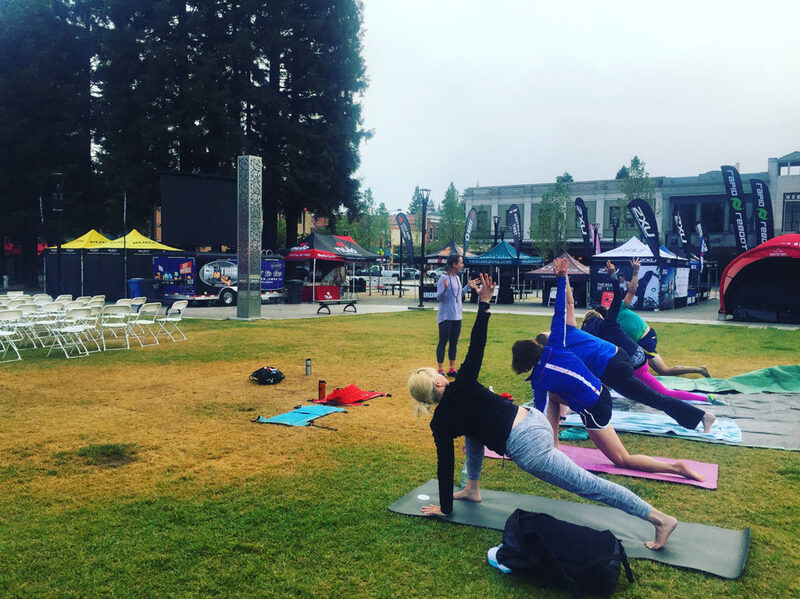 For me, and for our athletes, warm up is built into their training so when race day comes, it’s just like every other training day. Practice, practice, practice. Timing my warm up just in time so I walk into my swim time group and I’m ready to go. Caught a quick high five from Billy who’s energy I seem to feed off of (future training partner if and when he moves to SoCal!) and then we were off. Took out the swim at take out effort, the effort I’ve been practicing in the pool. Caught the inside line next to the buoys and got into a groove pretty quickly. First lap was pretty uneventful, until the final turn buoy back to shore. With the fog and sun shining through the trees, I somehow missed the final buoy which you have to turn on the right side of. After you’ve been following the buoys on the right back to the bridge, the last buoy you need to go to the right and then hang a left back to shore. I almost missed it, but heard the kayakers yelling to go back around. So I did. Didn’t overthink it. Just swam a few strokes back and around and back to shore. Out of the water for the quick run to enter my second lap, I see Billy standing in the water and he yelled out. Super cool to pick up a bit of energy from him there. Started the second lap and pushed it all the way around. Second lap was less congested and less fog, and certainly made the turn around the last buoy this time for sure. Exiting the water and up the ramp I ran. Most were walking, but I had prepared myself for this effort by doing deck ups in the pool and jumping up and down in between laps at the pool. Get the heart rate high and see how the body reacts. Wetsuit strippers were just around the turn, about half way up the hill under the bridge. Got stripped and continued to T1. Spent as little time as I could in the tent and out to the bike I ran. Soon after leaving T1 I was ready to go. Took the first 10 miles at a moderate pace, then just got into my plan. Push just enough so you are not comfortably riding, this is a race after all. And I’ve completed a few of these events, it’s time to race them and see how the body holds up. It was super energizing to hear some cyclists call out “YogiTriathlete” as I would pass by. My new race kit has our logo and “Triathlon, Yoga, PlantPower” on the back. Chatted with a few of them and they would share how our podcast has helped them with so many things. That was a sign to continue what we are doing. People are listening. Lives are changing. Keep going forward. Stuck to a solid nutrition plan of drinking every 10 min and consuming solid food every 30 min, whether that’s a banana or Amrita bar. In the first few hours I was jockeying with other cyclists, but soon after I didn’t see them anymore. And that gave me confidence that I was fit, and that I can hold this all day long. After entering town for the start of the 2 loops I was starting to feel it. That sensation in the legs that you are working them, and that this is why you rode 6+ hours over hills and mountains every Saturday, to prepare your body for this effort. These loops were fast. I definitely made up some great time here. I didn’t really get passed but surely passed others. I did take in 1 gel on the first loop. It’s something I don’t normally do, but felt the extra zing was needed. I finally peed on the bike during this first loop and it was awesome! Perfect timing, noone around, it leaked to the side and not on my bottles or bike. Perfect. Rode strongly in the final miles, all in aero as I was most of the day, and headed into T2 with some eagerness to get on the run. I couldn’t wait to see what the legs would do now after that effort! Left T2 with a banana in hand and heavy legs. That’s normal. Anyone out there wondering if the legs will feel heavy or worked, most likely yes, they will. But just keep going. It will change. I didn’t feel the banana so I tossed it around mile 1.5, only to pick one up at mile 3 because then, and only then, did my body feel like I needed it. And that is the takeaway. Have a plan BUT be flexible with your plan. Your body will show signs of what of needs and what it’s craving. Listen to it. Again, this comes through really having that mind/body connection achieved through meditation and yoga. Started cola on the run around mile 2 and kept at it the entire race. It’s something that worked so well for me in Louisville last year, I just keep doing it. I had maybe 2 more bananas and of course water at every aid station either in me or on my head. Ice down the jersey front and back. Kept a solid pace for the first 6 miles, and then was hoping to push it up a notch after that. Never happened. All I could do was keep moving forward and not slow down. 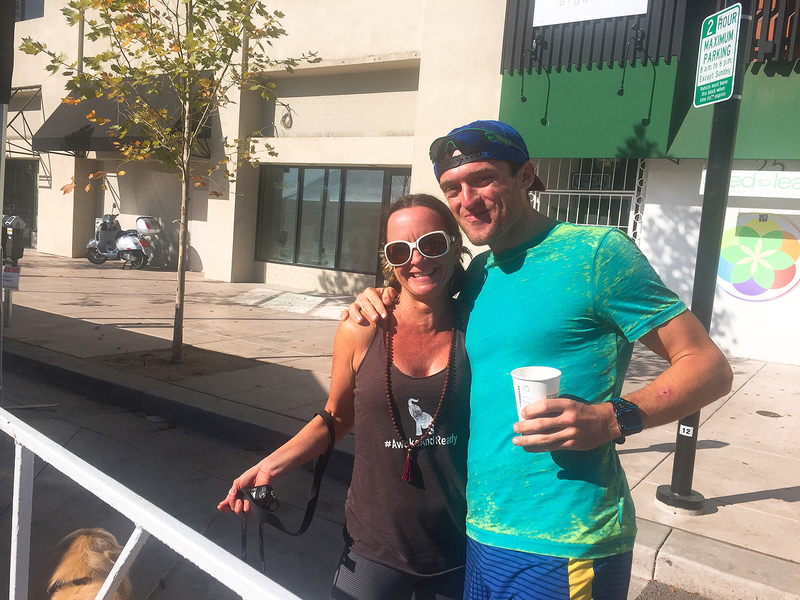 I saw Susannah and Troy numerous times out on the run course which is awesome because there are 3 loops and lots of out and backs. I do like this run. Super spectator friendly with lots of crowd support. Troy was looking so strong, so much so he ran his way to 2nd overall. And first-timer Susannah passed me somewhere on the run and finished 2nd in your age group. I’m in some really, really good company. These two are amazing athletes and continue to inspire me as I pursue my next race. The last 13 miles was a struggle. I was moving, but not at the pace I wanted. My legs were aching and I could tell that the bike took a toll on me. But I was ok with this. My strategy was to race hard. Not save it for the run, but to let my run perform to it’s best and only think of the run once I got there. Check. That was certainly accomplished. I don’t run with a watch, so the first time I knew somewhat of the time was when a spectator was telling a friend it was 2:45. So I did some math, and then ditched the idea. Trying to do math at the end of a marathon is quite challenging. Reverted back to my mantra for the day, “Be Relentless”, taken from Troy who was on our podcast a week earlier. Be Relentless. That’s what pulled me through those final miles. I learned in Lake Placid one year that if you just keep moving, don’t slow down, no matter what your pace, others will eventually just start walking or stopping at aid stations and this is where you make up positions in your age group. Pushed super hard the last 2 miles, or what I perceived to be hard. I gave it what I had. Even as you make the turn to the finish and skipping the turn to go out for the other loops, you still have 2 more turns to take before entering the finishers chute. I pushed, and pushed, and pushed. Form was shot (see photo) and I just wanted to give it my best. I crossed the line, and immediately felt dizzy. Took some time in the med tent getting hydrated and my blood pressure back up. 30 min later I got my photo taken and walked away with Jess and Clark closeby. Amazing race day. I am super grateful that I was able to be out there experiencing life. That’s what Ironman is about to me. If you want to know if you’re alive, give it a go. It will test your body, your mind and your soul. But only if you are fully prepared will you begin to take away the lifes’s lessons that make themselves present to you out there on the course. I took so many things away from this one. 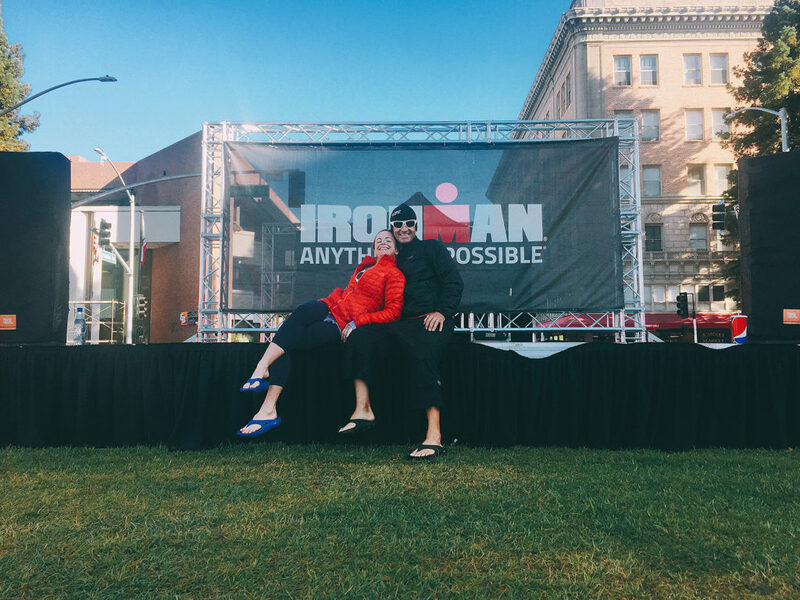 I’ll elaborate more on that in a later post, but for now, I will be working on my recovery and ramp up for Ironman Wisconsin on Sept 10 and Ironman Arizona on Nov 19. It’s a big year. But right now, I’ll just stay here, in the present moment, with my breath, and my awareness of my surroundings. Men 40-44 (14th) – Moving in the right direction! 4 Kona slots in AG 40-44, rolled down to 6th. 8 spots away. I’ll be back next year, May 12. See you there.